Inscape promotional poster, courtesy of Inscape ‘s Instagram page. 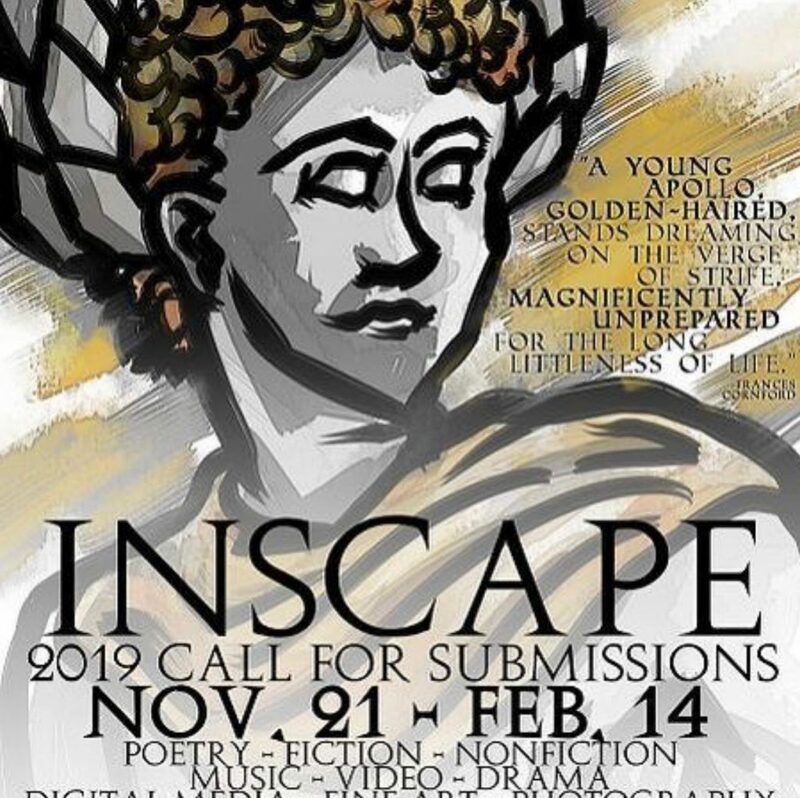 The submission deadline for William Jewell College’s creative arts magazine, Inscape, is rapidly approaching – closing Feb. 14. Inscape produces a print edition every year as well as uploading content to their website. According to Chief Editor, Becca Saffier, senior English major, the print edition of Inscape typically has around a hundred pages segmented into a diverse number of creative disciplines ranging from fiction to art to music. On average, the breakdown of the print version usually includes a dozen pieces apiece in art, poems and photography, as well as three to four short stories and creative non-fiction works, respectively, offering plenty of openings and opportunities for contributors in any one of those fields. However, those numbers are just rough estimates – the content of the magazine is dependent on the type and quality of submissions the Inscape editors receive. When asked about the value of Inscape on the Jewell campus, Saffier explained how the magazine provides an outlet for students on campus to utilize their creative capacities and talents. “I like the idea of encouraging people to embrace their creative capacities, and that if they write, draw, etc., that there’s a space on campus for them to be recognized for it,” said Saffier. It also helps to foster those creative talents and encourage students that if they are passionate about their creative skills they have a place where they can gain recognition for those abilities. When asked about what she loves most about being an editor and contributor, Savannah Hawley, sophomore Oxbridge: Literature and Theory and French major, emphasized the process of sharing creativity and being able to have that creative outlet that the arts magazine provides. “The artist shares with those that read the publication, the editorial staff shares the publication with the public, and the readers share in the process when they interact with Inscape. The movement of art between people – from creator to publisher to reader – is a process I have always been fascinated and in love with,” said Hawley. That is not to say that Inscape is only for people who have an abiding fixation on the creative arts. While English majors are, of course, welcome, a major in English is not a prerequisite for publication – all majors are equally and enthusiastically welcome. “We’ve had a lot of work featured from non-English majors that’s been really, really excellent. In fact, unless we know the contributor directly, we have no idea what their major is – nor do we care. The important thing is that we’re featuring original, student work,” said Saffier. Saffier affirms that all they care about is the quality of the work. “We’re not looking for the next great American short story, we’re just looking for work that has some heart and soul in it,” said Saffier. For students who may feel intimidated about the process or would like to submit but may be worried about the quality of their work, the editorial team encourages them to stop worrying and just submit. Oftentimes people are their own harshest critics and and even not having a piece accepted can be a huge learning experience that can be used to improve skills and submit again the next year. To submit a work or to find more information on Inscape, one can go to their website and follow them on social media on instagram, Twitter, and Facebook. A previous version of this article was published with several AP style errors. These have since been corrected.